We are proud to be known as one of the top DJs in Kingwood TX. Below, we are pictured at the Kingwood Country Club and performing a golf tournament and crawfish boil for SGS North America. We DJ a variety of event types in the Kingwood area and are a wedding, company party, and private party DJ specialist. We supplied the tunes, and SGS provided over 400 people to make the party great. 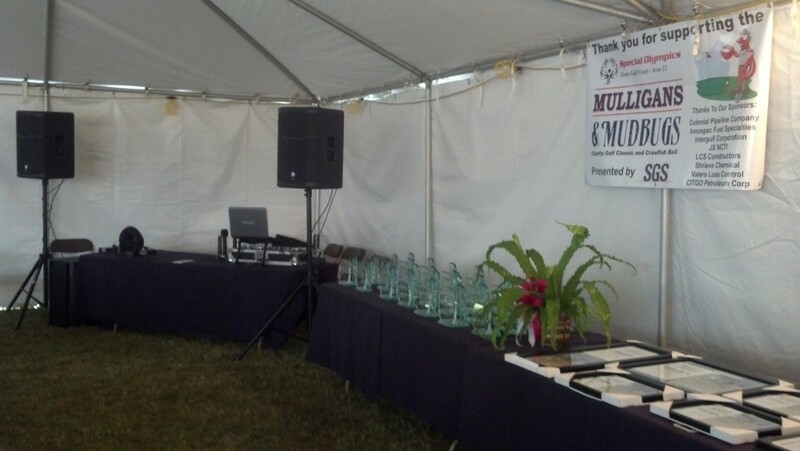 Many great awards were given out, and we were proud to be the MC that made all the major announcements. They also had a great raffle that benefited the Special Olypics and had some great items like Texans gear, sports memorabilia, and even a margarita machine. If you require professional announcements, let us know and we will provide top notch announcing, equipment, and wireless mics. Contact us today for if you have a need for one of the top DJs in Kingwood TX!